“Hazaaron khwahishen aisi ke har khwahish pe dam nikle. 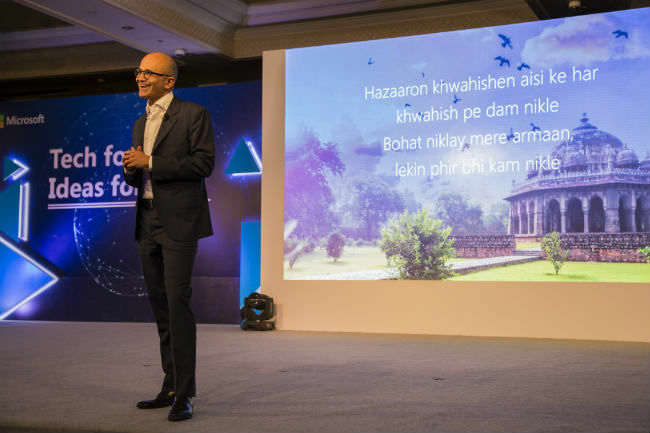 Bohat niklay mere armaan, lekin phir bhi kam nikle,” said Microsoft CEO Satya Nadella, quoting Ghalib, the famous Urdu poet from the Mughal era. 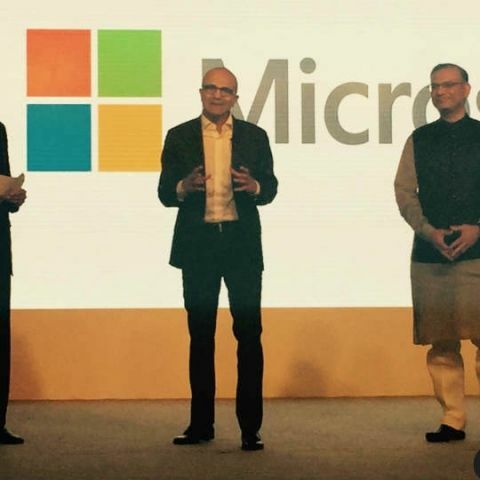 Nadella was addressing audiences at an an industry meetup for young entrepreneurs and startups that use Microsoft’s technology and services in India. In his inspirational address, Nadella stressed on the importance of being ‘cloud first and mobile first’ in powering the Digital transformation of the future. Here he quoted examples of startups such as iBot - maker of the world’s first connected processor that creates the Internet of Your Things, My Easy Docs Locker - an online document verification, storage & sharing service and Docs Wallet - another platform for securely sharing and receiving digital documents on the cloud. Nadella, who attended the event for a short duration, also spoke about Microsoft’s latest AI venture into Bots, which the company first announced at the Microsoft Build Conference, earlier this year. Encouraging developers in India to build upon the Microsoft Bots platform, Nadella said, “What if all you did was you spoke or you texted to get work done? That’s the world I think you can create. Infact, you will build bots that have this fundamental understanding of human language.” It is clear that Microsoft is focussing its strengths on creating computing experiences using artificial intelligence and human dialogue, and that the company wants developers around the globe to adopt to their Bots framework. Augmented Reality was also one of the themes for the afternoon. “Now for the first time in our history, we are able to take what is our field of view, and turn that into an infinite display.” Here of course, Nadella was talking about the Microsoft Hololens. Microsoft announced its HoloLens back in 2015.The device comes with its own CPU and GPU built into the headset, and helps users interact with Holograms wirelessly. Nadella ended his keynote by reiterating Microsoft’s three key areas of focus - Cloud, Bots and Augmented Reality. As Microsoft increases its presence, investments in India, we can expect much more from all 3 platforms in the near future.